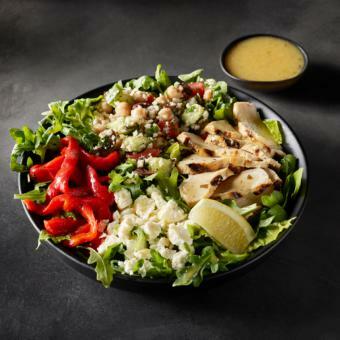 With a fresh leafy-green base this salad packs on protein and flavor thanks to grilled white chicken, cauliflower tabbouleh, olives, roasted red peppers, feta and lemon, all tossed with a red wine vinaigrette. It's a scrumptious way to get your greens. greens blend (lettuce, arugula), tabbouleh (cauliflower, cooked chickpeas [chickpeas, water, salt], cucumber, tomato, kalamata olives [sliced kalamata olives, water, red wine vinegar, sea salt, grape must], white wine vinegar, parsley, mint, black pepper), grilled white chicken meat (chicken breast with rib meat, water, salt, potato starch, onion and garlic powder, spice), red wine vinaigrette (canola oil, water, red wine vinegar, extra virgin olive oil, dijon mustard [distilled vinegar, water, mustard seed, salt, white wine, citric acid, turmeric, tartaric acid, spices], honey, sugar, sea salt, parsley, thyme, xanthan gum), roasted red peppers (roasted red peppers, water, salt, citric acid), feta cheese (feta cheese [pasteurized milk, salt, cheese culture, enzymes], potato starch [to prevent caking]), lemon.